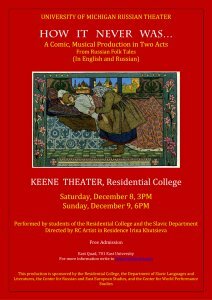 Act 2 - Three tales in English: " The Spirit from Another House", "The Man Who Laid Eggs", "How a Man Stopped Drinking" (Vasilii Firsov, translated by Michael Makin). Irina Khutsieva's successful Moscow-based Chamber Theatre, founded 2003, has put on a series of very well-received productions and has propelled a significant number of young actors to professional prominence. Under Irina's leadership, the organization has performed to critical acclaim at festivals in Germany, Poland, Holland, Finland, Austria, and Switzerland. 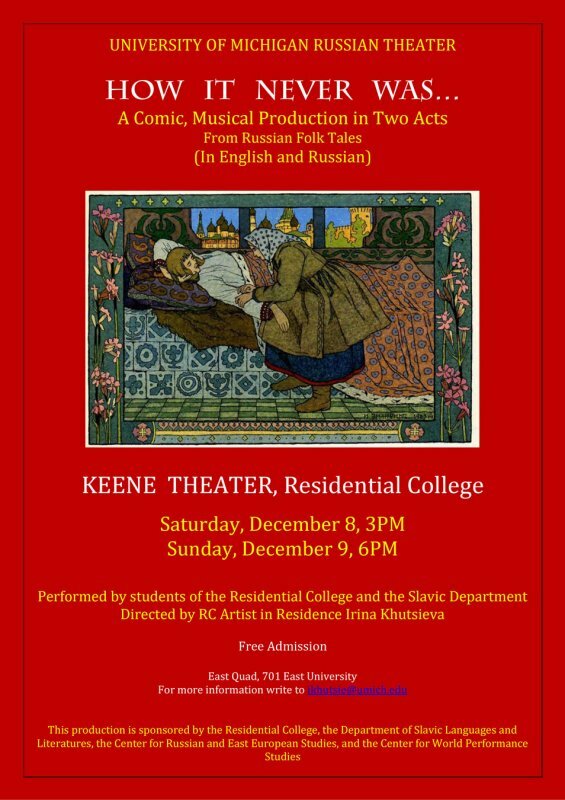 In the Residential College this term, Irina has staged dramatic études and plays based on Russian folk materials and literary tales, with one group working in Russian and one in English.